To view 2 more pictures, interactive maps and the full, detailed description of the Crystal Lake South community, please Login. Login to view an area map. 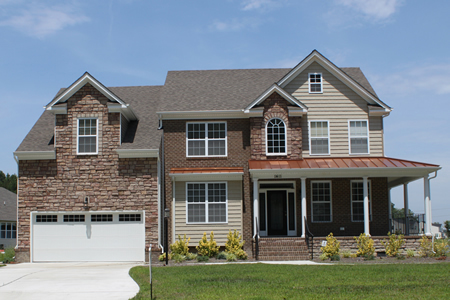 Located in exciting Chesapeake, VA, these houses allow for easy commutes to military bases like Naval Medical Center Portsmouth, Norfolk Naval Shipyard and Coast Guard Base Portsmouth. Entertainment, restaurants, schools and churches are even closer. Each of these newer established homes were built recently by a local builder and may include nine-foot ceilings, direct-vent fireplace, crown molding, granite kitchen countertops, Kenmore appliances, kitchen pantry, concrete patio, two-car garage and much more. Some plans may even include fireplaces in master bedrooms, sunrooms, covered front porches and kitchen islands. Homes typically range in size from 2,000 to 3,000 square feet. Water, water everywhere! Boaters, kayakers, canoe paddlers and fisherman will feel more like they’re in a park instead of newly developed land. Imagine the photographic opportunities that await in this land of lush, green trees framing these new construction homes. Walkers and joggers can stay fit using the walking paths that run through this community as well. Take pride in coming home to this scenic waterfront neighborhood. The abundance of land and water makes this community a natural oasis, while the location makes it simple to get around in Hampton Roads. Or Choose an Agent and request a free property tour! Send me more information about the Crystal Lake South new home community. Our agents offer free consultations and complimentary home tours. Providing customized real estate solutions to our real estate professionals and clients.